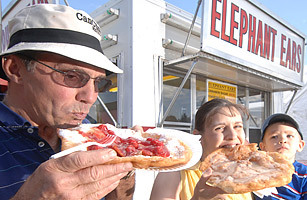 Fried flattened dough, butter, sugar, cinnamon  that's the elephant ear. It's a thin flank of fried sweetness that seems to be about as big as an actual elephant ear, but it's much tastier. This irregularly shaped staple of summer fairs and carnivals that contains no nutritional value and clocks in at an estimated 300 to 500 calories, is a favorite at carnivals across the Midwest. (I know from extensive elephant ear research I did as a kid.) Depending on your location, it could also be called a "beaver's tail" or simply "fried dough." And while it's big enough for more than one person, we advise you not to share. Read TIME's cover story about the last wild food  fish.